Arsenals Welsh midfielder Aaron Ramsey scores his team's second goal during the English Premier League football match between Arsenal and Crystal Palace at The Emirates Stadium in north London on August 16, 2014. Arsenal won the match 2-1. LONDON - Aaron Ramsey gave Arsenal a winning start to the Premier League for the first time in five years on Saturday, grabbing a stoppage-time goal in a 2-1 victory over manager-less Crystal Palace. The Welshman emerged as a scoring force in midfield last season, and carried on where he left off with his late intervention. "It was very difficult. 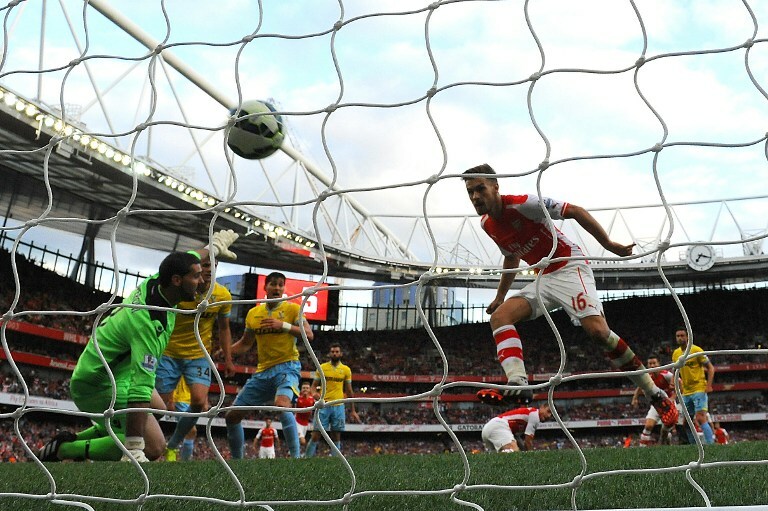 They came out and defended really well and were very tough to break down," Ramsey said. "They lost their manager earlier in the week but you&39;d never have known that the way they played." Ramsey&39;s goal in the FA Cup final in May ended Arsenal&39;s nine-year trophy drought, and he provided the perfect launchpad to win the league title for the first time since 2004. Performances, though, will have to improve if the trophy is to be taken off Manchester City. The winner was only scrambled in just after Arsenal gained a man advantage, with Jason Puncheon receiving a second yellow card in the 90th minute after receiving a second yellow card for a late tackle on Nacho Monreal. Puncheon had set up Palace&39;s opener in the 35th, whipping in a corner that Brede Hangeland was able to glance into the net with a header. But Arsenal equalised on the stroke of halftime, also with a defender heading in from a set piece. Laurent Koscielny was unmarked when he met a free kick from offseason recruit Alexis Sanchez. Although Arsenal paid $60-million for the Chile striker, this opening-day performance highlighted the need for more cutting edge up front, with goalkeeper Julian Speroni rarely tested. "We still lack a bit of pace in the final third," Wenger said. "Our fluency will come." In part, Arsenal&39;s collapse last season - after spending more time at the top than any rivals before finishing fourth - was down to injuries. And the new campaign opened with left back Kieran Gibbs being forced off at the start of the second half with a potential hamstring problem. "How bad it is I don&39;t know," Wenger said. Wenger is now in his 19th season as Arsenal manager - currently the longest-serving across English football&39;s four professional leagues. Pulis&39; departure meant the Frenchman was facing the most inexperienced manager, with Keith Millen in the Palace dugout less than 48 hours into his temporary reign. "Who needs a manager?" Palace fans chanted in the early evening summer sun. Pulis certainly proved his value to Palace last season, though, as he took control of a team facing relegation under Ian Holloway and won the manager of the year award as he steered them to an 11th-place finish. But his relationship with the club&39;s board apparently broke down over a dispute over how the team should be strengthened in the transfer window. Millen said he will speak to the Palace leadership on Sunday about whether he could stay in charge on a full-time basis - especially after his team successfully held out for so long against Arsenal. "Because of the physicality and organsational level of Crystal Palace it was very difficult for us," Wenger said.